Hey there! 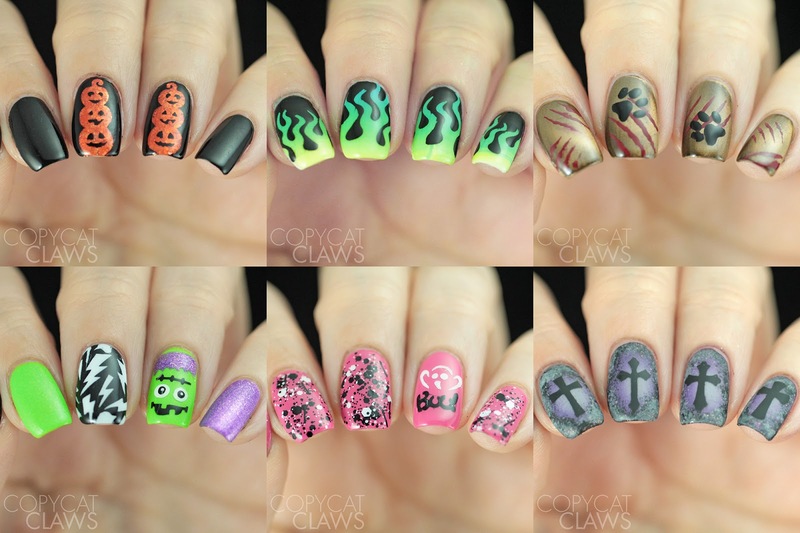 I have a bit of extra time this afternoon so I thought I should take advantage of it by showing you guys some of Whats Up Nails Halloween-themed stencils. I do love the Halloween season so it was fun to get a jump on it this year by playing with these in September. Plus that gives anybody that is interested enough time to get them in their hands before the big day! Here I have the Pumpkin Topiary, Fire, Kitty Scratch, Frankenstein's Monster, Boo and Gothic Stencils. 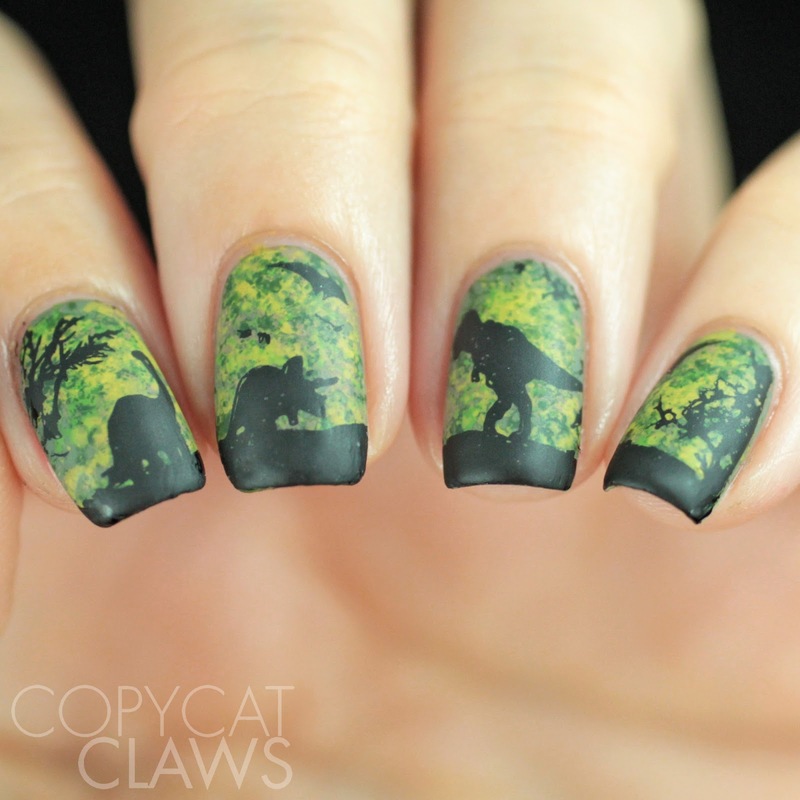 As usual, I was really impressed with the quality of Whats Up Nails stencils. I think using them has ruined me for some of the older ones I have! I especially love that they come in different sizes since we don't all have the same sized nails. Hey there! It's a sad, sad day. It appears to be the final 26 Great Nail Art post, possibly ever. 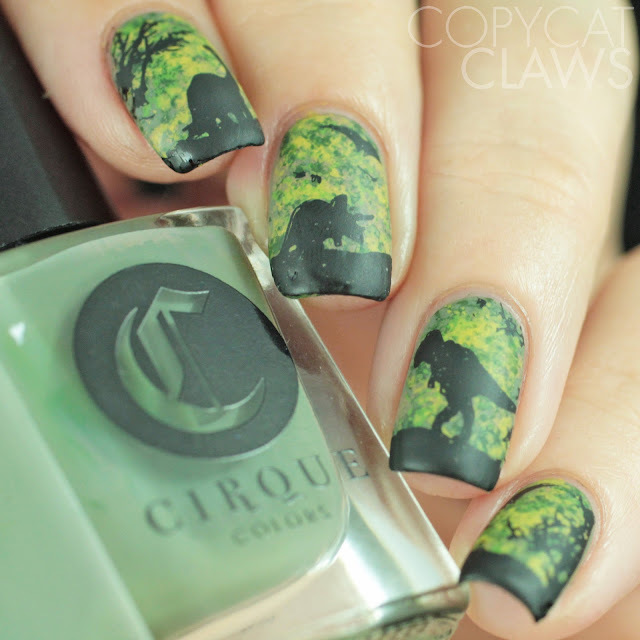 I've been a part of Crumpet's Nail Tarts for years and, since I joined, I haven't missed a theme. I might be late on some but I always got them done. But at least we're finishing with a fun prompt - we've been tasked with doing our signature styles. I don't think I have a signature style, personally, but awhile back Lady Maid Nails mentioned that I do enjoy the full mani "scenes" so that's what I did for today. Hey there! 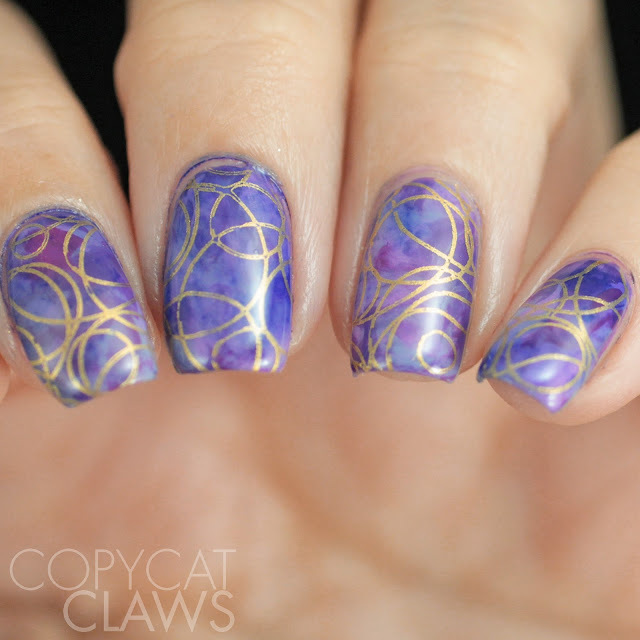 I just realized it's almost the end of September so I better post my second "inspired by a garment" mani that I did for the Nail Challenge Collaborative prompt this month. I said in my last one that my closet is mighty boring so there's not many patterns there. So I decided to use an article of clothing that I spend far too much time in as my inspiration, a pair of pajama pants. These things are so comfy I actually have at least 3 pairs in the same pattern! Hey there! Here we have my next instalment in the series of fun things Whats Up Nails recently sent me to try out. Yesterday I raved yet again about how much I adore their Magic Shifting Powders when I posted about Suntan. Today I have another one. This is Ocean, another summer-y name with a color that is gorgeous year round! 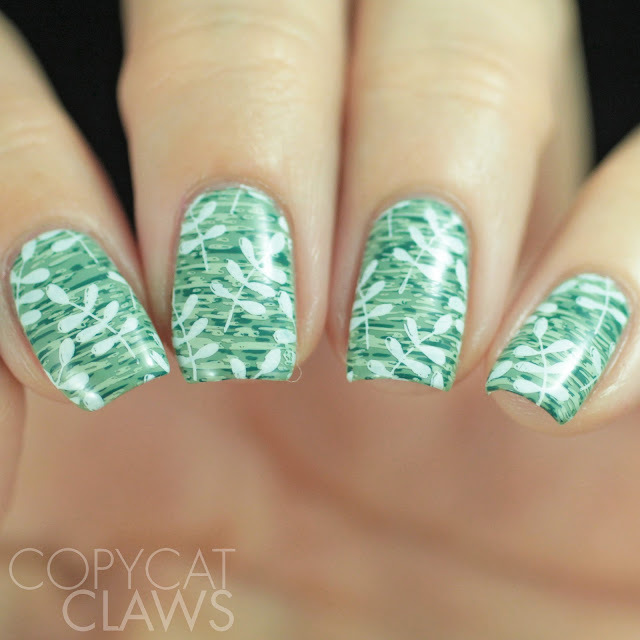 I also did a bit of stamping, pairing it with Rainforest since I can never leave my nails alone. Hey there! 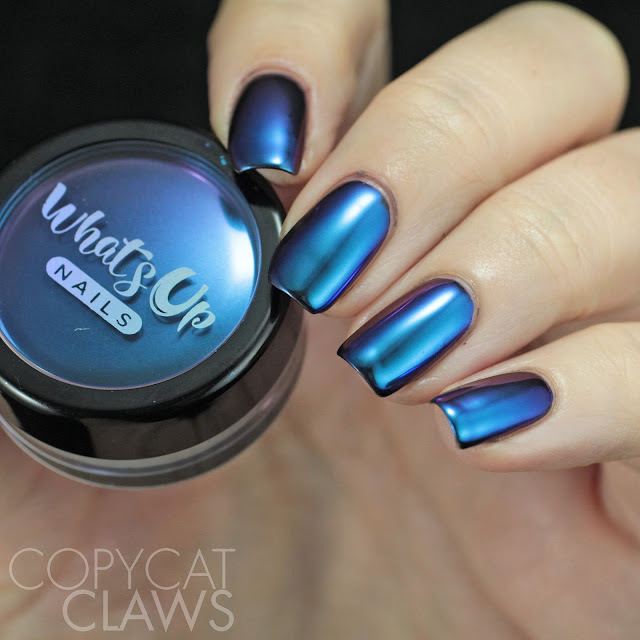 I have so many fun Whats Up Nails goodies to show you in the next couple weeks. They have lots and lots of fall and halloween themed stencils and stamping plates so I thought I better get them all posted ASAP so you guys have time to play with them while it is the season. 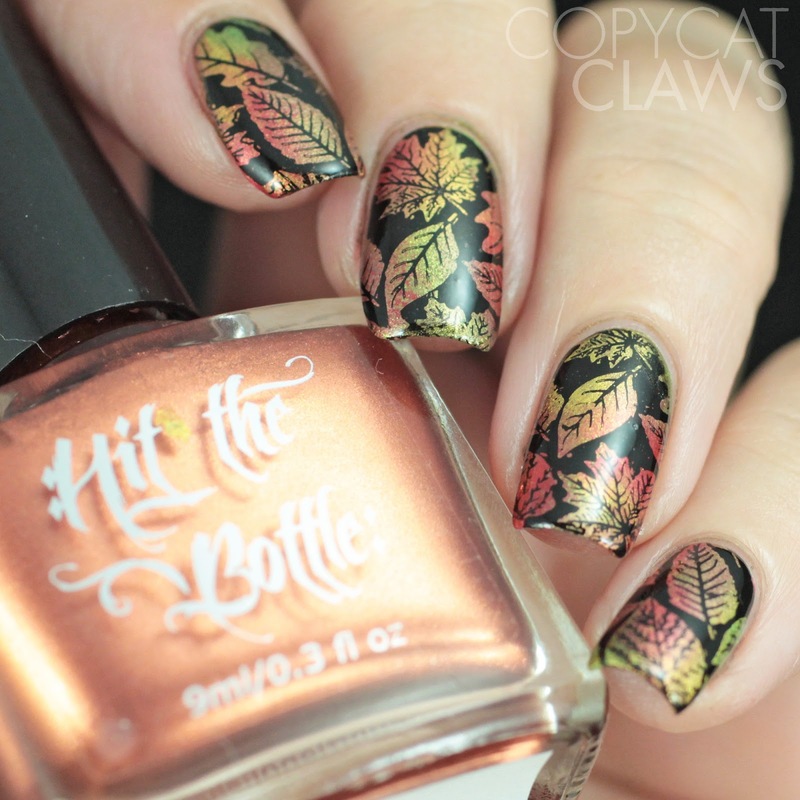 I'm starting with a couple of their autumnal stamping plates because, let's be honest, stamping is my true nail love! Here I have A011 and B021 stamping plates. 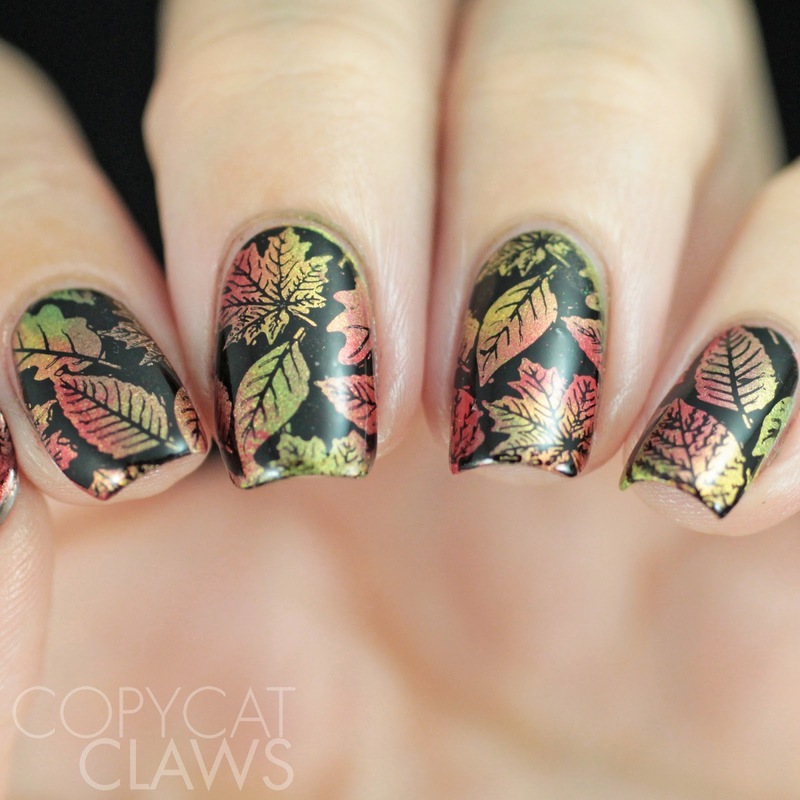 I promise there's a lot more to these plates than just leafy images but I was in a real fall leaves mood when I was playing with these. I also used the Suntan Magic Shifting Powder as a base for my first mani here so I have some pictures of that on its own as well (and a comparison to Sunset) for anyone who's been wondering how it looks. Be sure to keep reading to see the other fall images they have! Hey there! 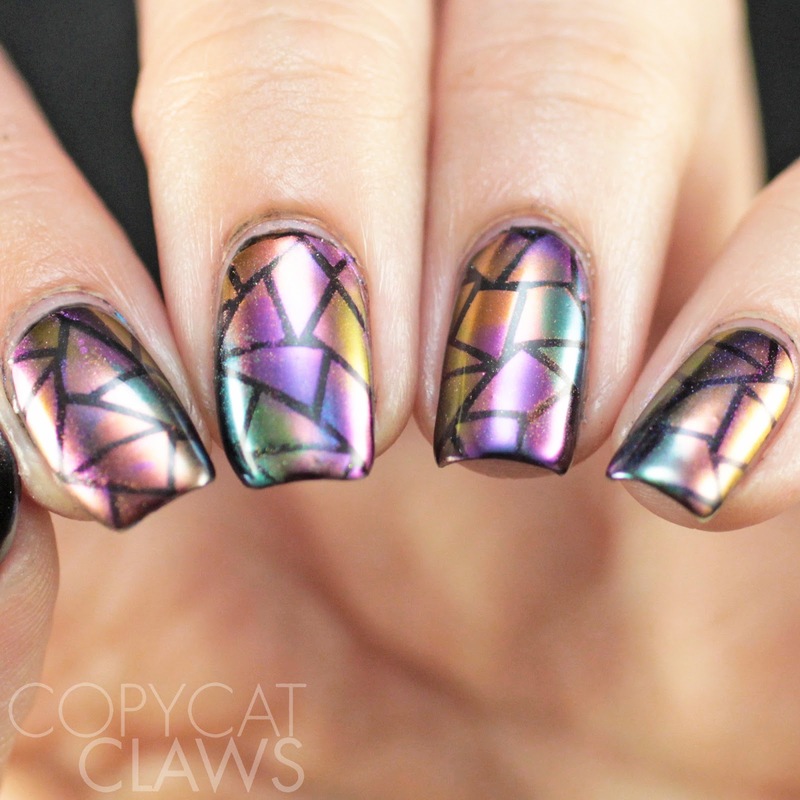 Today's Nail Crazies Unite prompt is chevrons. 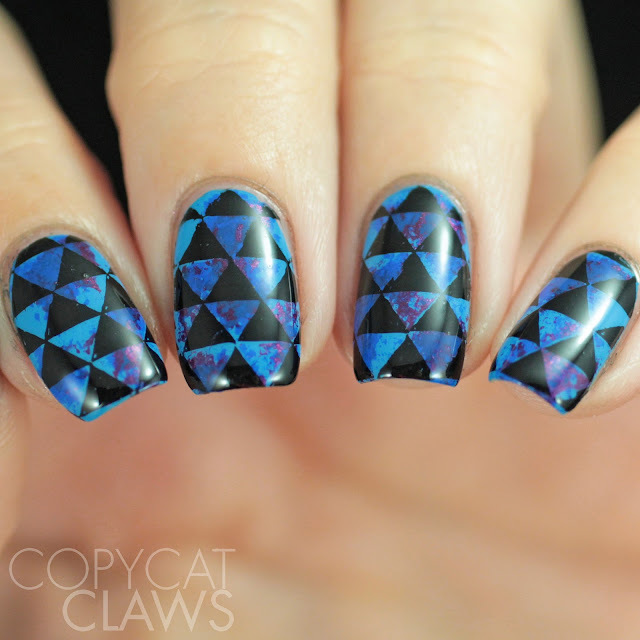 And who doesn't like a good chevron nail design? They're pretty common around me since they're the only thing my sister is usually willing to stamp on her nails. 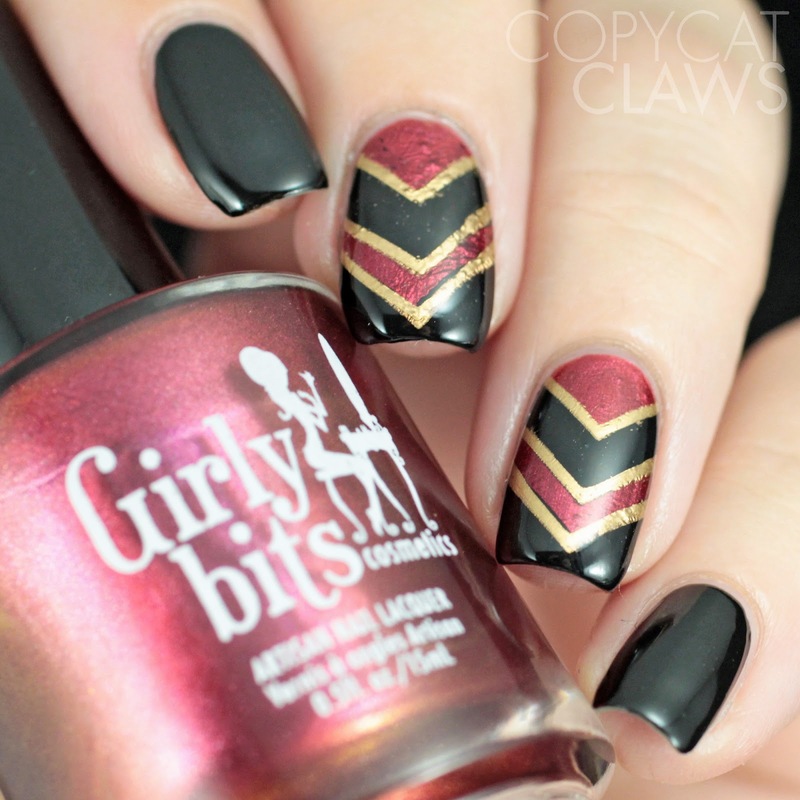 Usually I would do the zig zag style of chevrons but I felt like switching it up so I went more with one big chevron for this look. Hey there! The weather here has certainly turned chilly (it even snowed this week!) 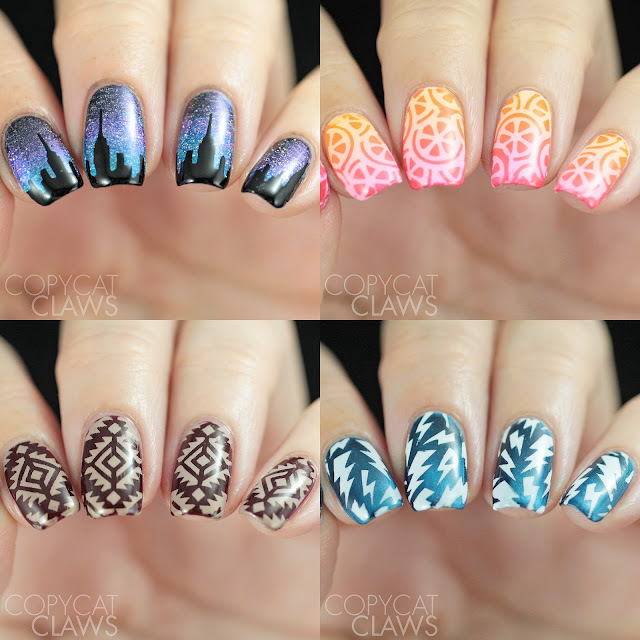 which makes it the perfect time to warm up with the most recent stamping polish collection from Mundo de Unas, the Cancun Collection. 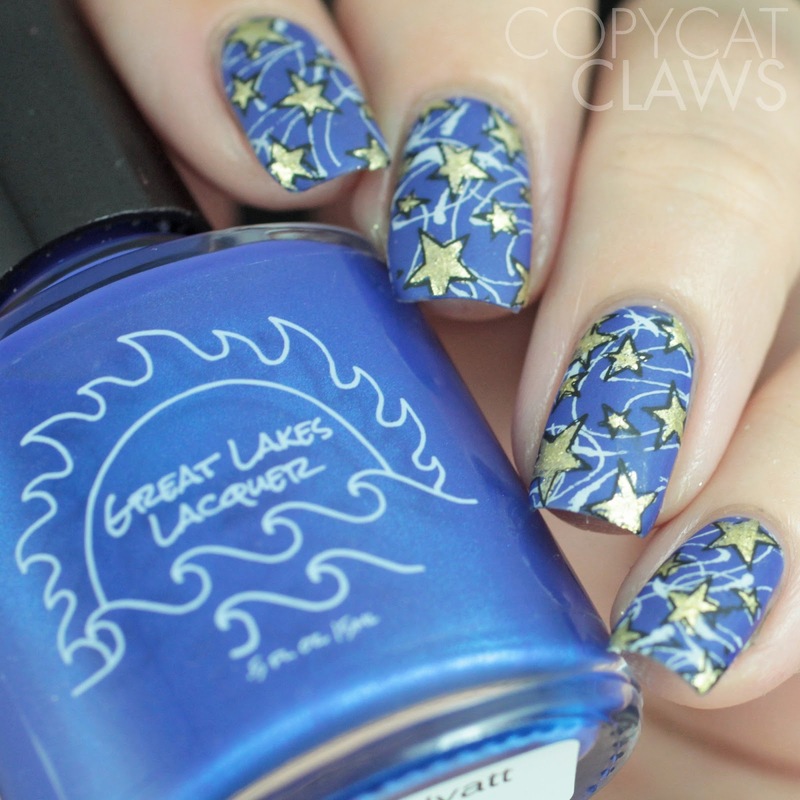 If you've read my blog at all, you might notice I use A LOT of Mundo de Unas stamping polish. I have purchased almost every one of them, many more than once. Therefore I was pretty excited to see they had a new collection. 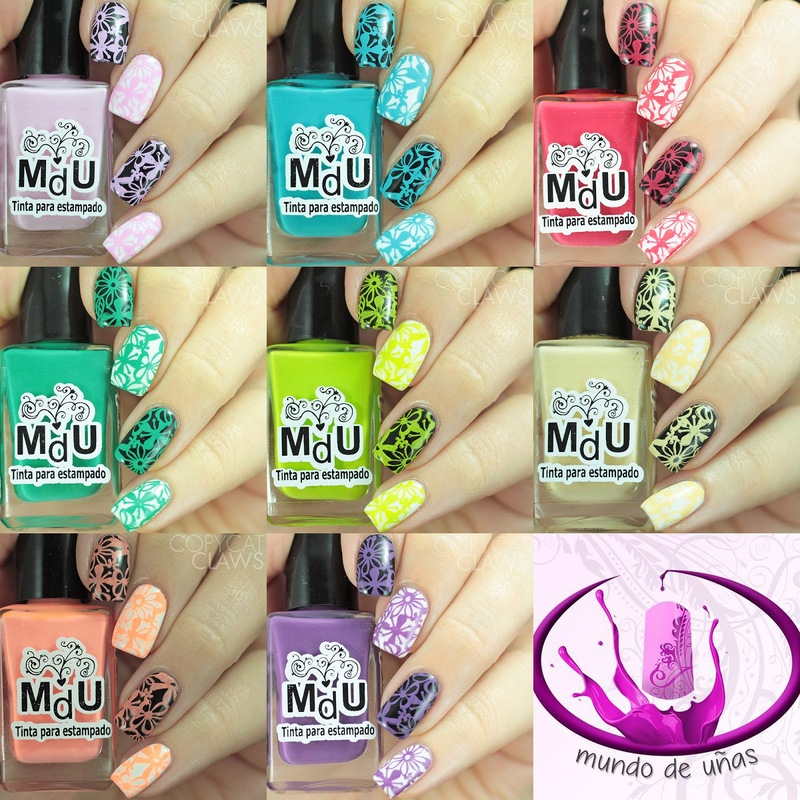 Today I have swatches of the 8 new stamping polishes and some comparisons with other Mundo de Unas stamping polishes so you can see which might best fit your stamping needs. Hey there! 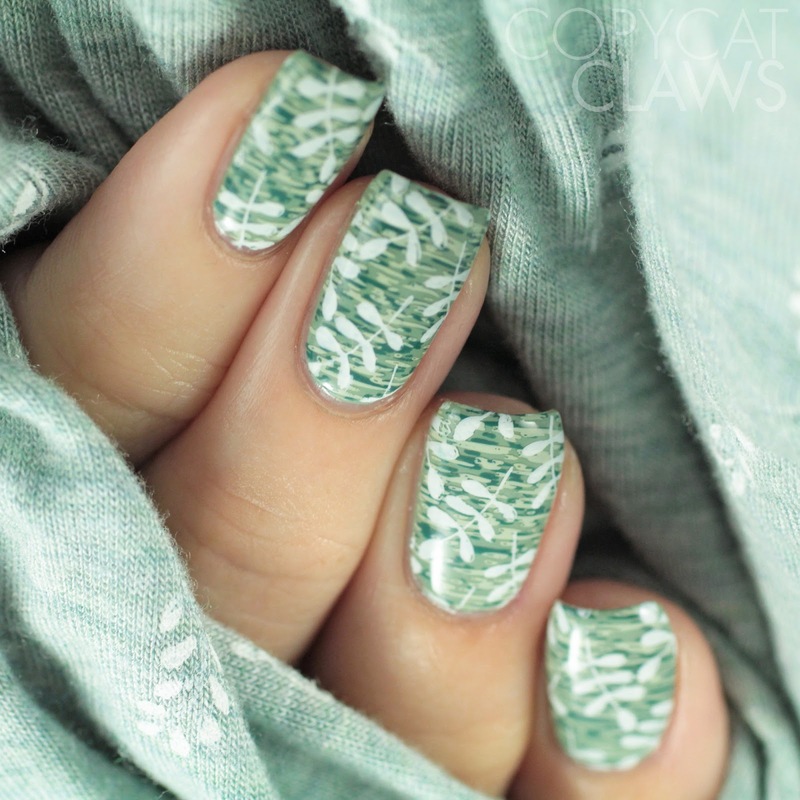 This month the Nail Challenge Collaborative Facebook group has a fun theme...but one that is super hard for fashion-challenged me! 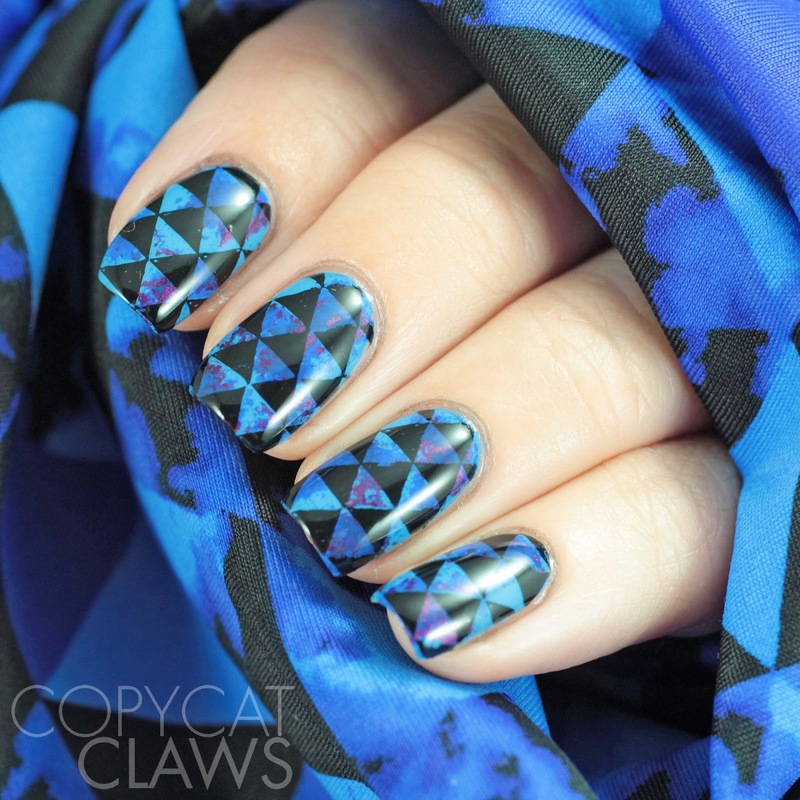 We're doing "inspired by a garment" mani. But honestly, I pretty much only wear solid colors (though I do love stripes too) so I was tempted to just paint my nails black and call it a day! But I looked at what I had laying around. I had just done laundry so my swimsuit was hanging out to dry and I thought it would make a pretty cool nail design so that's what I did! Hey there! I hope everyone had a great weekend. Mine was fun but I think I need another weekend to sleep! 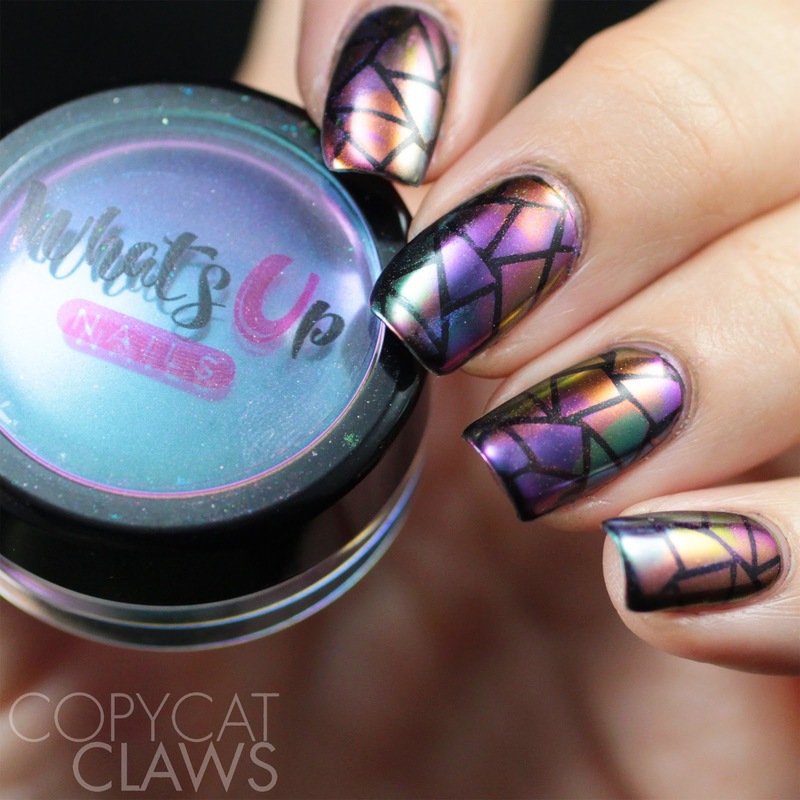 I actually spent all day yesterday playing with some new Whats Up Nails products but today I'm sharing some that I used not quite as recently. 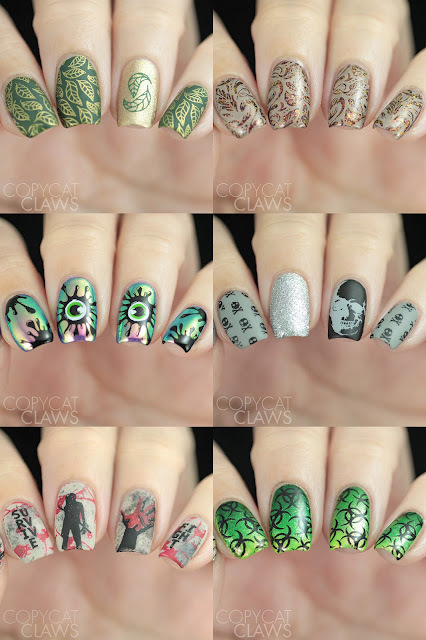 I'm a big fan of their nail stencils so it's a good thing they have such a big variety of them to pick from. Here I used the City, Citrus, Aztec and Lightning Stencils. Keep reading to see what I did with them. Hey there! Today is a combo theme but it's one that I knew what I wanted to do for as soon as I saw it. 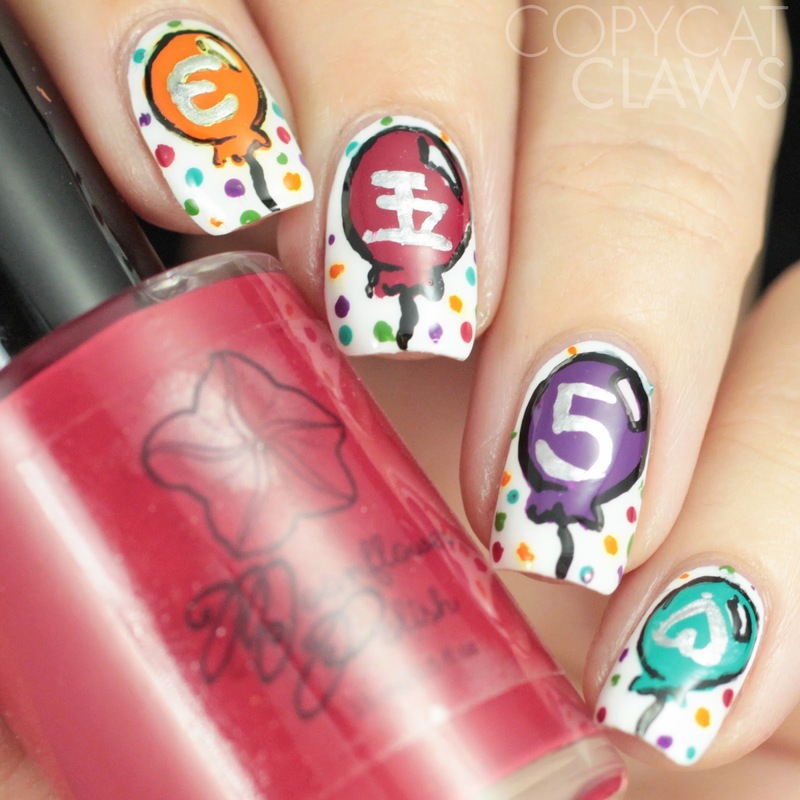 It's the final Digit-al Dozen 5th birthday mani PLUS 26 Great Nail Art Ideas Autumn theme. There's so many pretty colors in autumn (or fall, as I tend to say) that it was easy to find 5 that I wanted to use. 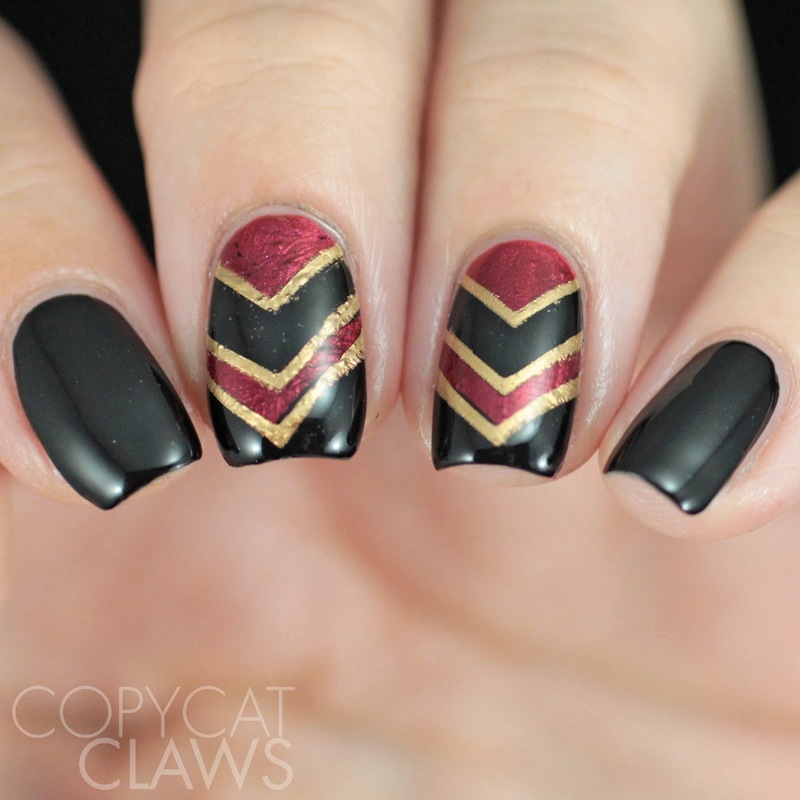 Paired up with a negative space UberChic Beauty image, I had an easy fall mani! Hey there! In my google searches for things that come in 5's, I found that stars have 5 points. 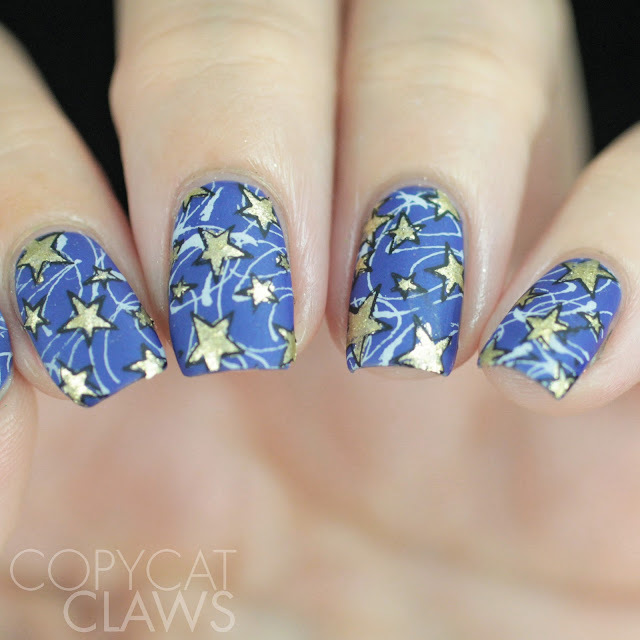 That was a good enough reason for me to do a star mani for this week's Digit-al Dozen anniversary celebration. Seriously, if anyone else knows of things that come in 5's, I'm all ears! Hey there! I've been waiting so long to post this mani. It's been torture since I was pretty much gaga over it! For today's Digit-al Dozen 5th birthday mani, I used 5 of the Magic Shifting Powders from Whats Up Nails. It just so happened that I have 5 of them that I've previously reviewed so it worked out perfectly for this theme. I paired them up with the Mosaic Stencils and ended up absolutely loving the final look. Hope you do too! Hey there! In my quest for things that come in 5's for this week's celebration of the Digit-al Dozen's fifth birthday, I thought of "5 golden rings". 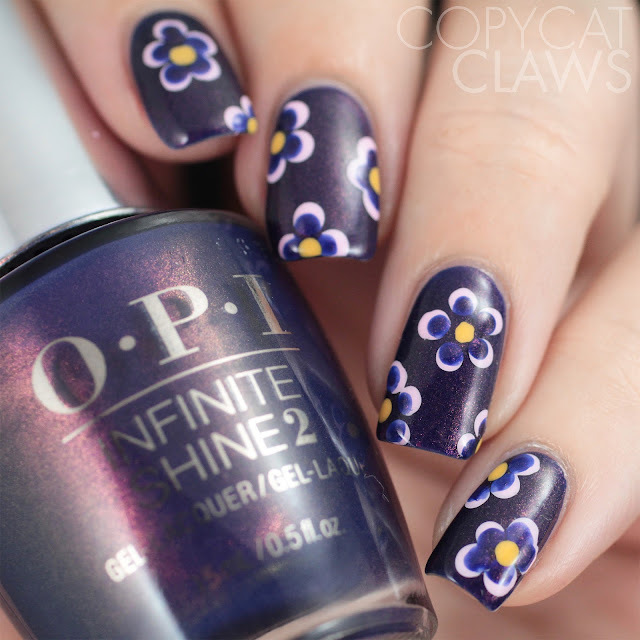 But really there's zero percent chance that I could actually paint 5 circles (circles are REALLY hard for me) but I remembered this stamping image from UberChic Beauty that is a bunch of overlapping rings. In the end, there's far more than 5 golden rings on my nails here but that's okay, right. 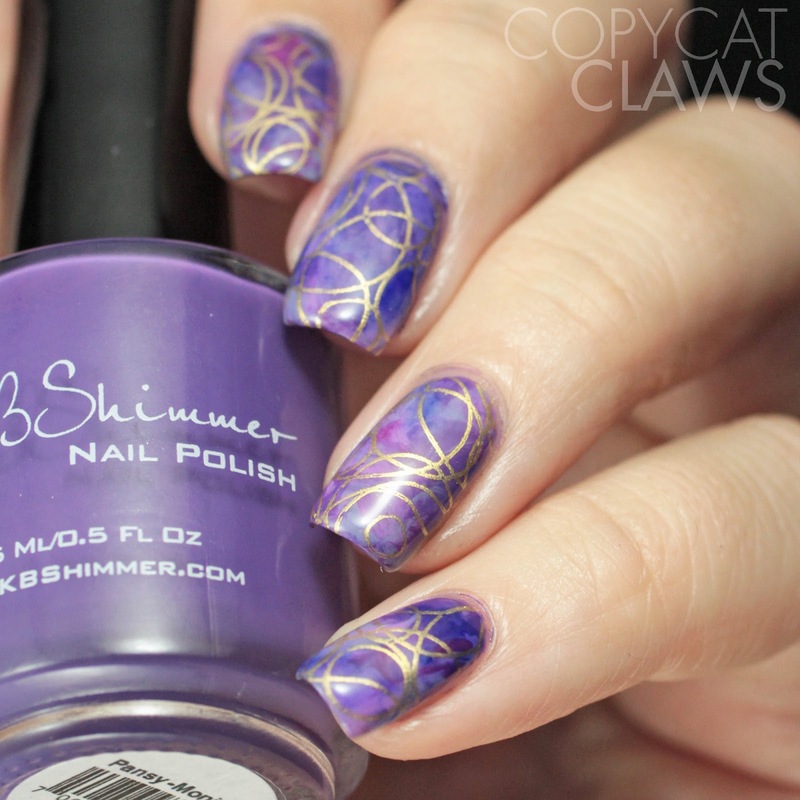 Plus, just to make it more of a "5" mani, I used 5 different KBShimmer purples in the base so it totally counts, haha! Hey there! This month we're celebrating the Digit-al Dozen's fifth birthday. I'm so happy to be a part of a group that has been around for 5 whole years, even if I've only been around for a couple of them. The theme was a tough one though. I tried to think of things that came in 5's and there's really not many. Luckily, Katherine of Procrastinails suggested birthday ideas and I totally stole one of them. 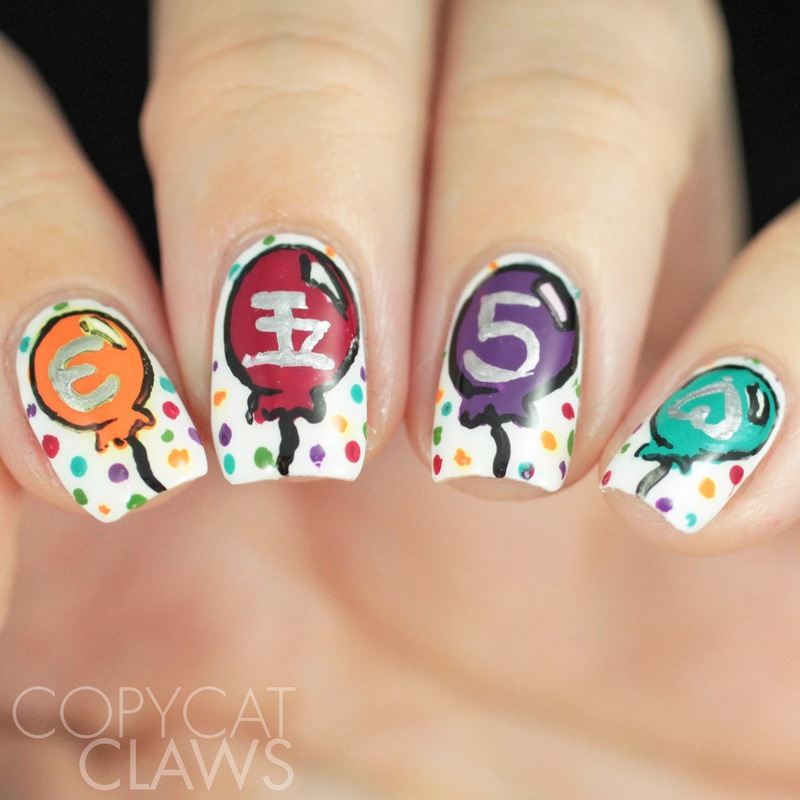 So today we have balloons with what I'm hoping is the number "5" in different languages. Hey there! 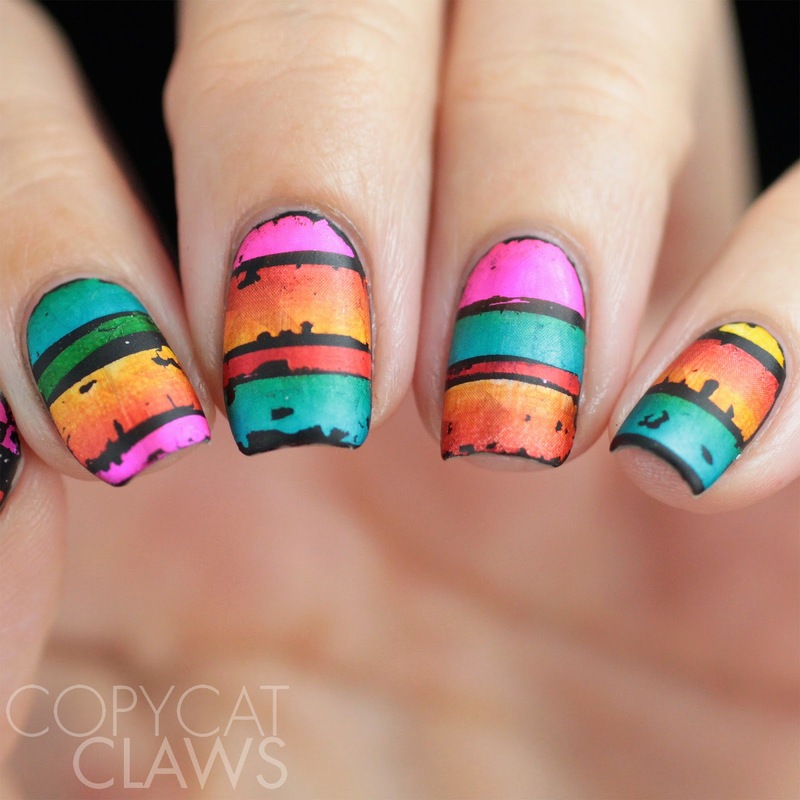 This week's Nail Crazies Unite prompt is stripes. 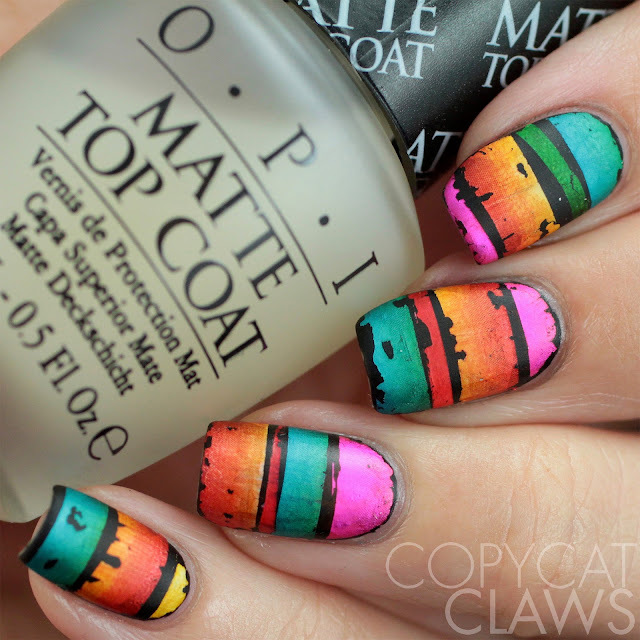 I do love striped nail art. I thought this would be a good excuse to copy a gorgeous look I saw from @laqvid. 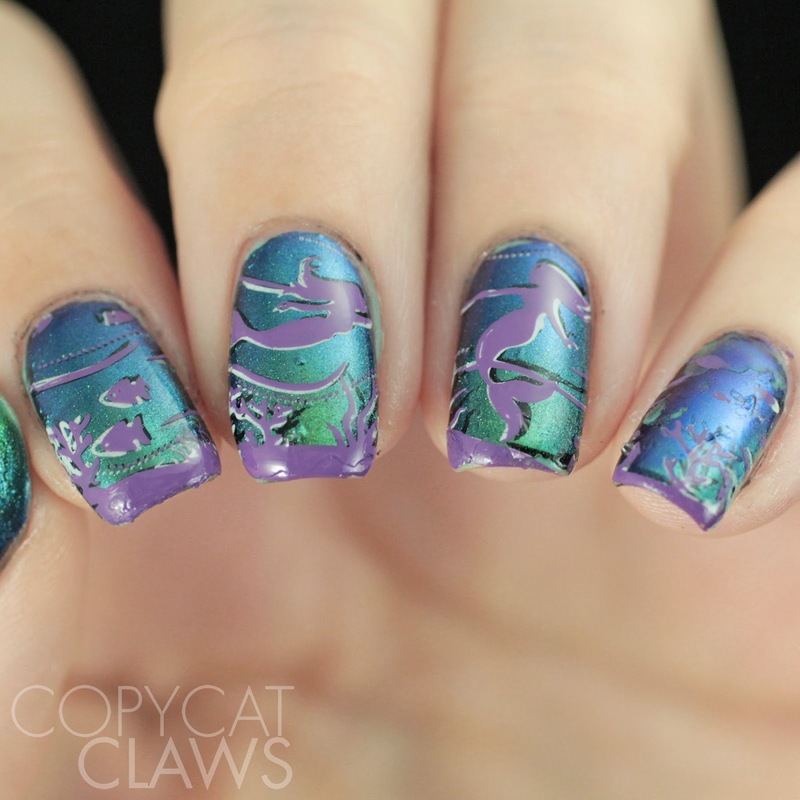 I had a bunch of gradient nail foils that worked so well for these. They turned out looking like a Mexican blanket. I have to admit, I really love these. One of my favourites in awhile! Hey there! Today's is a super sparkly post. 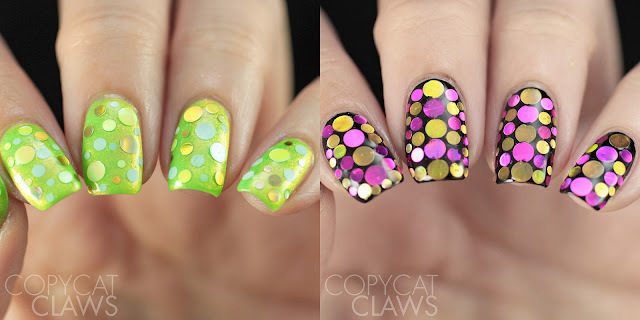 I have two versions of the Whats Up Nails "Confetti" to share, the Margarita Confetti and the Flower Confetti. This product is a jar of loose circle glitter that comes in lots of different color combinations. As a lover of circle glitter, I really like this product, especially because it's really inexpensive. If you're willing to place glitter on your nails like this, your only decision is what colors you want to get from their selection (which can be found here). Hey there! School might be back in but that doesn't mean we don't get to keep on wearing bright, fun colors on our nails, right? 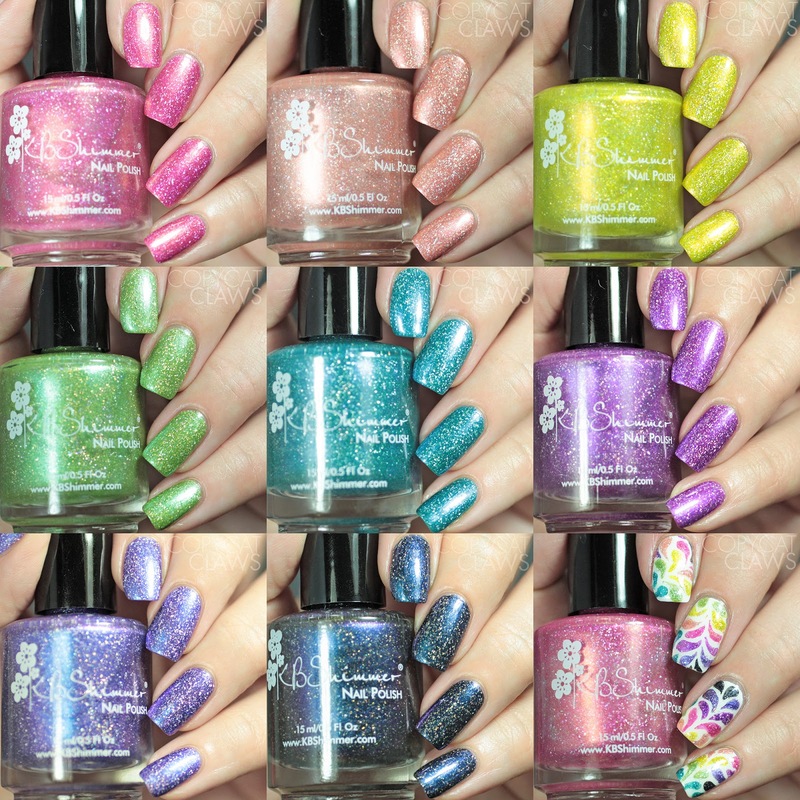 Just over a month ago KBShimmer released this collection called Summer Vacation but I will honestly wear these year round. 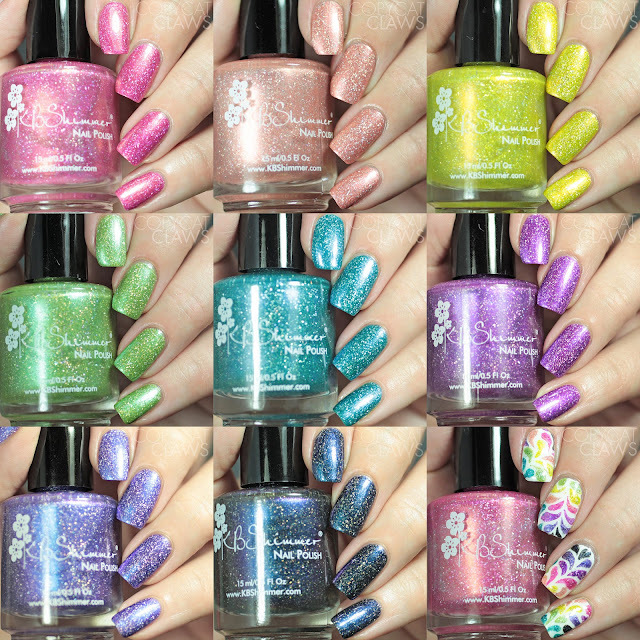 Color4Nails was nice enough to send them for me to review all of these drool-worthy shades. Unfortunately, the border held them up for awhile so I didn't get them until last week but they were well worth the wait. KBShimmer has called this finish "holo glow flake". I don't know what the magic is but I don't have anything like these. They have holo flakes which give them sparkle but there's also a shimmer-y metallic look to them that makes them really unique. Hey there! Back to school time, eh? I'm long past the days of school but I do work on a university campus and it certainly feels different here today. Whether or celebrating or cursing the start of school, today I have a little nail art distraction with Bundle Monster's Shape Nouveau stamping collection. There are 5 plates in this collection of "chaotic modern pop art designs." While I don't necessarily think all the designs here have to be chaotic, they are certainly pop art. The possibilities using this collection are endless. I have 4 manis that I did wearing them, including one with one of the 3D rotational studs (which was an absolute blast to wear)! Hey there! This week's 26 Great Nail Art Ideas prompt is one I have struggled with before. We were tasked with using dotting tools but not just for dots. I remember I did a blobbicure for this type of prompt before so I didn't want to do that again. But what else can you do with dotting tools?! 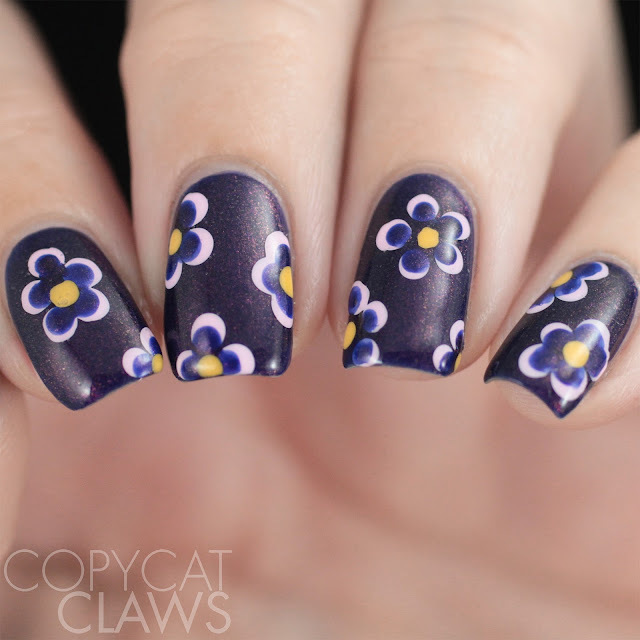 Well I found this awesome tutorial for using dotting tools for flowers. They are still dots but they get transformed into pretty flowers so technically they're not just dots, right? Hey there! 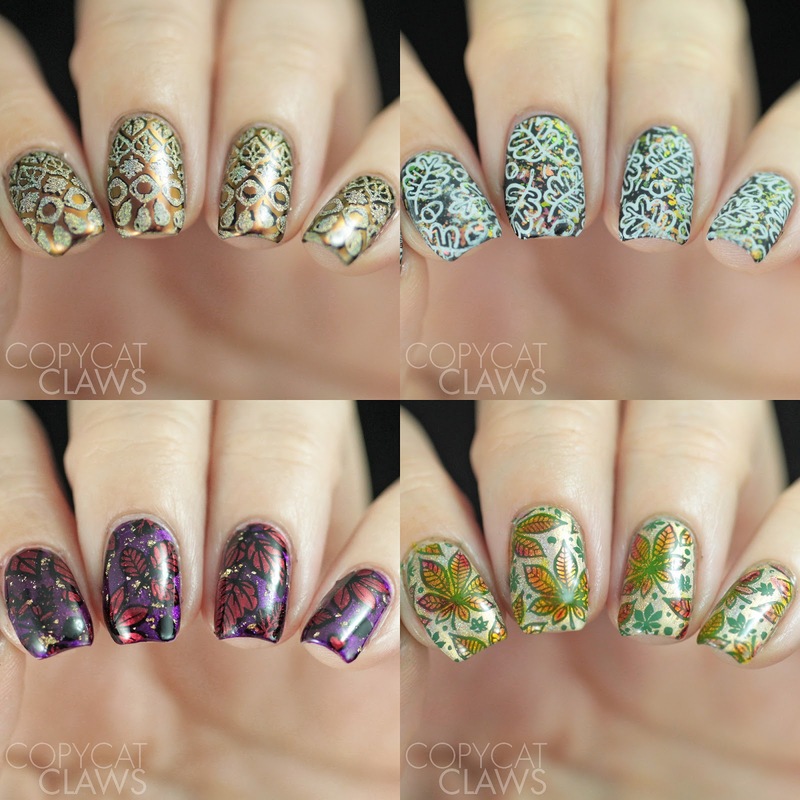 Yesterday I showed you guys UberChic Beauty's latest collection of stamping plates (Collection 20) and today I have the rest of the new release. She's really on the ball this year so we have new Lovely Leaves, Halloween and Zombie Love plates early enough that there's lots of time to play with them this fall. It felt a bit strange to be doing Halloween nails in August so I tried to keep it a bit more generic. Plus it goes to show that we can all be pulling out our Halloween plates year round!